The Paris Feast: Chateau of Cheverny : The manor behind Tintin's Marlinspike Hall. Chateau of Cheverny : The manor behind Tintin's Marlinspike Hall. May 1942, Hergé was about to send Tintin on his 11th adventure and inquisitive Hergé frisked through the encyclopedia Larrouse and travel brochures for inspirations. There in one such brochure he stumbled upon a castle that would be the future home of Captain Haddock and Tintin, acquired by Professor Calculus. He called it the Moulinsart in French which came around by flipping over the name of the Belgian village Sart-Moulin. In the English speaking world the manor is known as Marlinspike. The manor according to the Tintin series was built by the illustrious ancestor of Captain Haddock, Sir Francis Haddock (Chevalier François de Hadoque in French) and was introduced for the first time in the volume ‘The Secret of the Unicorn’. That was fiction, but in reality the manor exists, and it does in France, in the valley of the river Loire, and it was the travel brochure of this chateau that inspired Hergé to create Moulinsart or Marlinspike Hall. Chateau of Cheverny is one of the Châteaux of the Loire Valley, the region in central France dotted with ornate castles and manors. The Loire Valley was the seat of the French kings of the Renaissance period up until Francis I moved it to Paris in the 16th century. Even afterwards, the wealthy bourgeoisie of France continued to renovate or build new chateaux as their summer residences in the Loire valley. Four years back I visited some of these chateaux mainly that of Blois and the more popular Chambord. During that trip I spent half a day at the little town of Cheverny and its famed chateau, and what brought me there was mainly its link to my favorite comic series, Tintin. I could surely not miss a visit to Marlinspike Hall being so close to it. Cheverny is around two hours’ drive from Paris, at a distance of around 200 km to the south. Many guided excursions can be opted for, from Paris for the Chateaux of the Loire. I however chose to visit the region on my own and so I took a direct train from Paris to Blois. It takes around one and a half hours and tickets can be found on the SNCF website at very reasonable prices. Cheverny is around 16 km from Blois and a bus service can be found which runs from Blois in a round trajectory with stops at the chateaux of Chambord and Cheverny (line 18 as of now and available between April and November). So that’s how I got to Cheverny. Now let me describe the chateau itself and the things you can enjoy when you are there. The original property around Cheverny was bought by Henri Hurault, count de Cheverny who was a lieutenant-general and military treasurer for Louis XIII in the early 17th century. He was supposed to have built a fortified castle which hardly remains today. It was his son Philippe Hurault who built the present chateau around the 1620s. Thus Philippe Hurault is our Francis Haddock if we draw analogy with Hergé’s Marlinspike Hall. The ownership since then changed many times and after centuries of deterioration, renovation and restorations, the present manor came to be owned by the descendants of Henri Hurault, the Marquis de Vibraye, who opened the caste to public in 1922 making it the first chateau of the Loire Valley to be opened to visitors. The castle presents unique pieces of furniture and remarkably preserved interiors. The apartments on the 1st floor demonstrate the art of French living: the room where children were born, the children's room, the private dining room and many other treasures such as the 17th century tapestry of Gobelins (which was used by the French Royal house) or the cabinet of Louis XIV made by André Charles Boulle. These are marvelous objects that should not be missed while visiting the chateau. But now let us come to the Tintin link. 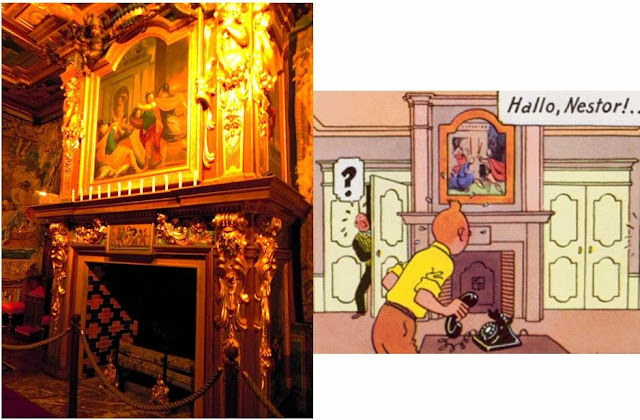 Just for starters the fireplace the Hergé placed in Marlinspike Hall throughout the series is almost an replica of that in the King’s Room of the Chateau of Cheverny (mainly the portrait above the fireplace). For other replicas of the Marlinspike Hall that can now be found in Cheverny, here is the story. This 54 chamber grand manor was becoming almost impossible to maintain and in the 1990s, Charles-Antoine de Vibraye, the owner of the chateau ran the risk of derailing the six centuries old link of his family and the Chateau. Then as he points out himself, “Tintin came to his rescue”. Given the obvious resemblance of the chateau and Marlinspike Hall (Moulinsart in French), the old sketches of Hergé that were copies from a tourist brochure of Cheverny of the 1940s, and after 5 years of discussions, the Foundation Hergé finally accepted to host a permanent exposition of Tintin at the Chateau of Cheverny in 2001. This is the exposition (Secrets of Marlinspike Hall) that visitors can experience at the adjoining property of the chateau and relive the moments with figures, displays, sounds and videos of Captain Haddock, Professor Calculus, Castafiore and of course the little Belgian journalist, Tintin. The exposition consists of some original manusripts of Hergé (donated by the Hergé foundation) and many recreated replicas of the objects that were used throughout the Tintin series, for example the shark submarine build by Professor Calculus or his innovative weird television and the objects Abdallah used to annoy the Captain. Hergé remained faithful to the original details of the façade including the windows, the statues and the central tower. He must have chosen Cheverny owing to its French Renaissance design but also its simplicity compared to Chambord or Blois, which can be used for the main manor of a comic series. For the simplicity of course Hergé left out the outer wings of the façade. Then a simple walk in the huge garden and park surrounding the Chateau is something to be indulged in. The Chateau of Cheverny also has a reputed kennel which dates back to the 1850s and still has more than a hundred dogs. The Bourgeois of the epoch kept these dogs to accompany them during hunting. The breed at Cheverny is a cross between the English Fox Hound and the French Poitevins and you can also attend the feeding session of these hounds each day at a particular time, when at the Chateau. Thus simply if one is a lover of Tintin and one happens to search for a day trip from Paris, then the Chateau of Cheverny is a must, and of course when in the region, one should not miss the other Chateaux of the Loire, mainly the famed Chateau of Chambord.